Dubai (AFP) - As Libyan commander Khalifa Haftar's forces fight for control of Tripoli, his success depends more on his ability to win over local militias than on the prowess of his troops, analysts say. Less than two weeks after Haftar's self-styled Libyan National Army (LNA) launched an offensive to seize the Libyan capital -- home to the UN-backed Government of National Accord (GNA) -- a rising death toll and slowed advance indicate his troops are facing resistance by loyalists of the GNA, headed by Haftar's arch-nemesis Fayez al-Sarraj. Libya has been gripped by political chaos for years, since the 2011 NATO-backed overthrow of dictator Moamer Kadhafi. And the North African country has also felt the ripple effect of the Gulf diplomatic crisis, and tensions between the UAE and Qatar, Karim Bitar, director of research at the French Institute for International and Strategic Affairs, told AFP. With regional dynamics increasingly at play in Libya, Haftar will have no choice but to woo local militias as he pushes westward, to take Tripoli. Haftar's ties to Saudi Arabia and the UAE are critical to his campaign to drive Sarraj from Tripoli and emerge as Libya's uncontested leader, analysts say. 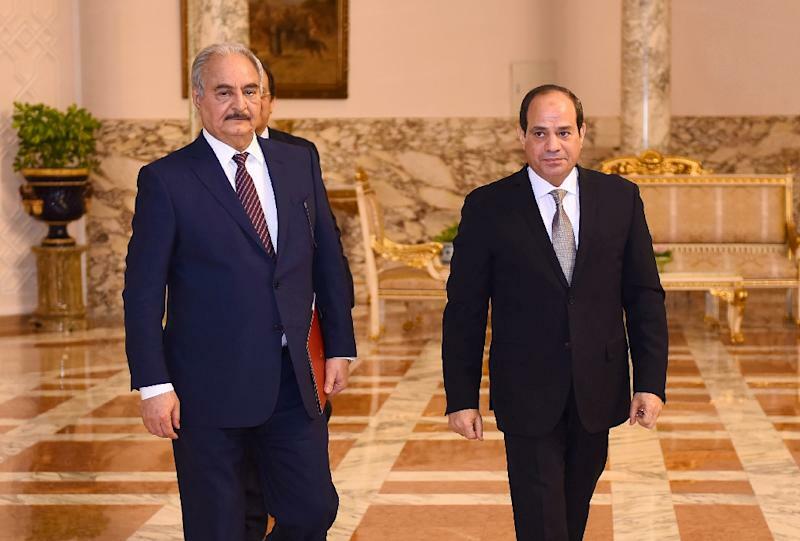 "Haftar's hatred for the Muslim Brotherhood, which maintains some influence in Tripoli and within pockets of the official government, has made him popular with Saudi Arabia and the United Arab Emirates (UAE)," says a report by the Soufan Group published Monday. "Both Riyadh and Abu Dhabi view the Muslim Brotherhood as a considerable threat to their respective rule and both strongly support strongmen like Egypt's al-Sisi and Libya's Haftar precisely for their anti-Brotherhood stance." At the start of the offensive launched earlier this month, Haftar's press agency published images of long lines of brand new armoured vehicles in a show of force. The images came days after Haftar was in Saudi Arabia, where authorities are said to have pledged tens of millions of dollars to his troops, according to a Wall Street Journal report published Friday. Haftar was also in Cairo on Sunday, shortly after UAE Crown Prince Mohammed ben Zayed held talks with the Egyptian president. The offensive is likely also a result of the dispute between Saudi Arabia and its allies on the one hand, and Qatar and Turkey on the other. Doha and Ankara are strong supporters of Islamists in western Libya. Riyadh and Abu Dhabi are not, and Haftar's LNA regularly accuses Doha and Ankara of supplying weapons to its Islamist rivals. And in the labyrinth of Libyan politics, the LNA may not be able to singlehandedly seize western Libya -- a complicated region home to not only Islamists, but militias and armed groups antagonistic to the Government of National Unity. The opacity of the Libyan political scene is rooted in the incontrovertible influence of "gangs, criminals, and jihadists switching sides in a complex patchwork of fleeting alliances," according to the Soufan Center. "Haftar can only succeed in his offensive if he succeeds in turning alliances around and winning the support of certain tribes in the west, where territory is dominated by local forces," said Mathieu Guidere, a professor at the University of Paris and specialist in Arab politics. "He must draw inspiration from the system set up by Kadhafi in his day to control territory in the long term," Guidere told AFP. "Otherwise he does not stand a chance of rebuilding the country's territorial unity under one government." At least 147 people have been killed and more than 600 wounded in 10 days of fighting, according to the World Health Organization. And some analysts fear the worst is yet to come. "I think Haftar has major difficulties on the ground in western Libya," said Andreas Krieg, a professor at King's College London. 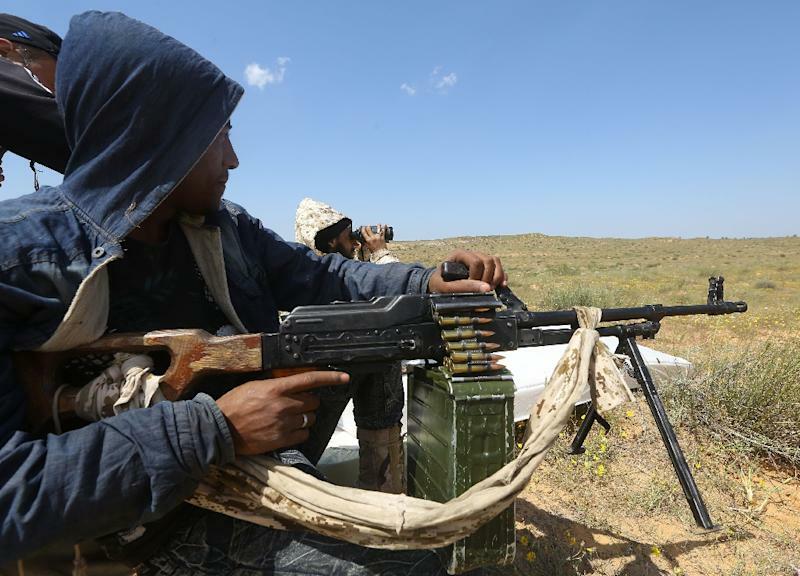 "He is now bogged down in an atrocious war between his loose band of militias, the Libyan National Army, and those militias that try to defend the Government of National Accord," Krieg told AFP. "They feel that they didn't make the sacrifices in 2011 to have another military rule by Haftar." 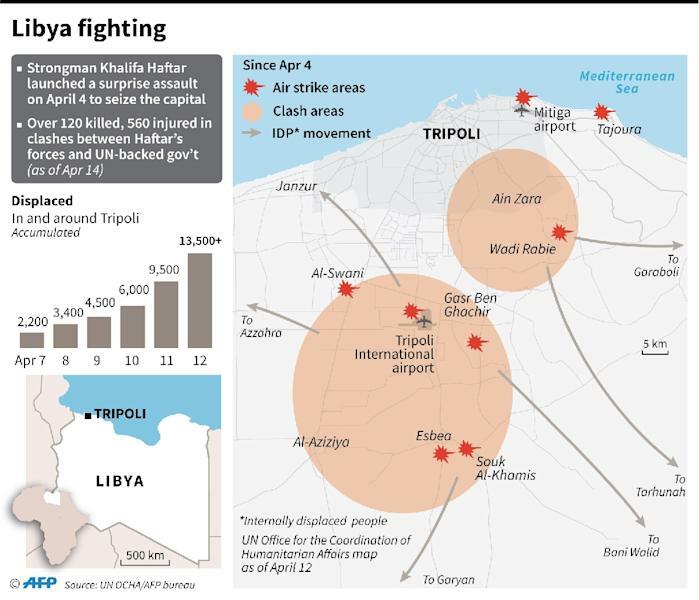 And even should Haftar take Tripoli, his position may remain difficult. "Haftar's bet is risky, but he has benefited from the empathy, open or tacit, of many Arab and western countries," Bitar said. "It will be difficult for him to become the 'Libyan Sisi' as Libya lacks an army and central institutions as deeply rooted as those of Egypt," he added. "His power will thus remain shaky."